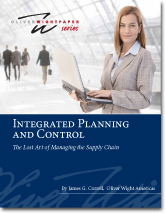 Oliver Wight Americas, Inc. has released its newest white paper, “Integrated Planning and Control: The Lost Art of Managing the Supply Chain,” which is also being presented through an online webinar. Jim Correll, an Oliver Wight principal who has assisted more than 20 companies attain Class A performance, shares his insights into improving operational performance, customer service, and financial bottom lines by properly applying Integrated Planning and Control (IPC). Correll points out a concern that many companies have neglected building competency in Integrated Planning and Control. There is now a generation of people who aren’t familiar with Integrated Planning and Control, how it impacts a supply chain, and how to develop interconnected planning and execution processes in their companies and supply chains. The author notes that performance measures are needed in order to determine whether processes within these elements are performing as desired. This measurement process must include methods for determining the root cause of poor performance and determining accountability for corrective actions. Correll shows how weaknesses in any element of IPC will impact the effectiveness of the other elements. The net result of the failure to link these elements is people working to different plans and objectives at the detailed level. He adds that these companies struggle to execute plans, even good quality plans, from Integrated Business Planning. As a result, they waste time, money, and energy trying to satisfy customers because they use ineffective processes. They “leave money on the table” through lost sales caused by product availability problems and through needless investment in inventory and resources. The paper also points to the concern that many companies lack the basic fundamentals described above for IPC, and that the people who once had the competency to design, configure, and operate IPC processes have retired. Without adequately educated replacements, this has resulted in the loss of institutional knowledge which, in turn, is causing needless erosion of operational and financial performance. Correll provides examples in which companies have implemented Enterprise Resource Planning (ERP) systems but, given a lack of IPC institutional competence, respond counter-productively to the data. For example, one person in Master Supply Planning and Scheduling responding inappropriately to an ERP action message can cause hundreds of people to take the wrong actions. In closing, Correll states that these adverse situations can be avoided or corrected and result in significant operational and financial dividends through a reawakening of organizational competency in Integrated Planning and Control. Read this white paper now. Oliver Wight Americas, Inc. – thought leaders and hands-on practitioners for over 40 years. As a global business management consulting and education firm, the company specializes in helping organizations work smarter, faster, and better than their competitors. Its principals are seasoned professionals who have real-world manufacturing experience and transfer this knowledge throughout an organization, providing tools to help organizations internalize that knowledge and achieve a competitive advantage in the marketplace. The largest world-wide consultancy of its type, Oliver Wight has offices throughout Europe, North and South America, and the Asia/Pacific Region. For more information, please visit http://www.OliverWight-Americas.com.